As Saxattack’s live riffs take centre stage, the session moves into a whole new dimension, weaving electronic and organic sound into the mix – the impact obliges you to move – electronics and live sound – passion and punch. 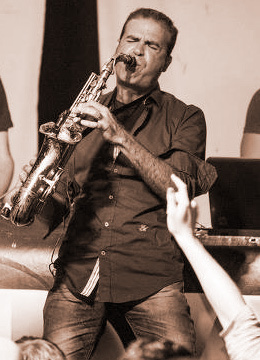 Saxattack is David Riberas. Alto, tenor and soprano saxophones. Arranger, composer and producer, graduate of UB, Taller de Musics BCN and EMB, among others. Saxattack plays in the best parties in town and in the most glamorous clubs around as: Space (Ibiza), Pacha (Ibiza), CDLC, Shoko, Bestial, Opium Astoria, Opium Mar, Sotavento, Luz de Gas, Bikini, Pacha BCN, Oshum, Átic, Club Eclipse (H.W), Catwalk, H. Om, Bestial, Coppelia Club, MVP, Sutton, New Casanovas, Nick Havanna, Privat, Dada, Cocoa, Macarena Beach Club, Broadbar, La Sal, EiBiSi, Silenci, El Sielu, Menfis, Dada, Dalay, Friends, Passarel·la, St. Trop, Malibu, Ocean Club (Marbella), Budha (Andorra), Surf, Krafwerk (Germany), La Cote (Montpellier), Platinum (Rabat), Extrablatt y So Lounge Club (Marrakech), Punjab (Rabat), Le Ranch Club (Mohammedia), Bombay Club y Bo-m (Rabat), Boulevar (Mockba). As a producer, he is a co-founder of the Hot Music BCN label, and with his partner Dj. Puku has produced tracks like “I Let You Funk Me”, “Oriental Love”, the first “Mediterranean Chill Experience” album: “The Sound of the Island”, among many others tracks, remixes, compilations…He has also produced for TV channels such as Antena 3 TV: the soundtrack of the program “Señoras que” and radio such as Punto Radio Catalunya: the soundtrack of the program, “La Nit en Blanc”.